Your child’s first tee ball practice is the first step towards a lifelong love of baseball. Although tee ball doesn’t require much gear as little league will later down the line, you do need to make sure that the equipment your child uses is comfortable, appropriate for their size, and right for the sport. Tee ball teams don’t usually require baseball pants, cleats, or jerseys, but a good bat is crucial for safety and for helping your child learn proper swing mechanics. Check with your child’s coach about equipment availability before the season starts. Many teams bring a few spare bats and gloves to loan out to kids who don’t have one, but you can’t always count on those being available. Buying your child his or her own bat makes it easier to practice at home, and it’s a special rite of passage, the first of many bats they might use in their baseball-playing lives. Also, tiny bats are extremely cute, and everything about tee ball is an appreciate to appreciate how cute your kids are before they get too big to put up with it. Tee ball bats are of course much smaller than baseball bats, but they do come in a few different sizes. Go to a store with a good selection, and have your child try a few out. To check length, have your child stand with their arms spread out shoulder-height, in a T formation. Hold the bat so the bottom is right at the center of your child’s chest and the rest of the bat runs along their arm. If your child can comfortably reach the top of the bat with the palm of his or her hand, the bat is the right length. You can also rest the bottom of the bat on the child’s chest and have your child reach out and grab the barrel of the bat. If this is easy and comfortable to do, the bat is a good fit. If there isn’t enough space to do either of these things (sporting goods stores can sure get crowded right before baseball season), just have your child stand the bat on the ground next to their leg, like a cane. If the other end of the bat hits the child’s palm, you’re good to go. Bat length is an important factor in bat control. A bat that’s too short will be tricky to connect with the ball and will be frustrating for your child, as well as feeling off-balance. A bat that’s too long will encourage the kid to swing wildly, like a club, which is bad for learning the mechanics of a proper swing and unsafe for other players. Baseball bats are measured by something called the “drop.” A bat’s drop is the difference between its length and its weight. Manufacturers print the drop number on the bat, usually on the handle or the barrel. Just subtract the drop number from the length of the bat to find its weight in ounces. For example, a 25-inch bat with a drop of 10 weighs 15 ounces, a pretty hefty weight for an average-sized tee ball player. Almost all tee ball bats have a drop between 10 and 14. Once you’ve determined the length you need, try some bats of different weights and see how comfortable they are for your child to hold. It should be fairly easy for your child to hold the bat out to his or her side with one hand for at least 30 seconds. If the bat starts to wobble or they drop it, go down to a lower weight. Although the MLB may stick to good old-fashioned wood, that’s not always the best choice for a young player due to its weight and the risk of breakage, especially for tiny tee ball bats. Most players these days use bats constructed with a one-piece design made out of either alloy metal or composite. Alloy bats are more durable and make a satisfying “ping” sound that can be a lot of fun for a young batter, while composite bats feel “springier” and are a little easier to whip across the plate. Remember to check with your child’s coach to make sure there aren’t any restrictions on bat material, because some leagues prefer that all athletes use bats made out of the same material for consistency and fairness. Many families hold on to sporting equipment to hand down to the next generation. I myself started my tee ball career with a chewed-up wooden bat that had been used by three other kids in the family before me. Baseball is all about tradition, so this can be a very meaningful rite of passage. You may even have a more practical reason for wanting to start with second-hand equipment. Kids grow fast, especially at this age, and a tee ball bat won’t be much help in little league, especially if your kid grew half a foot between summers. Used equipment is perfectly fine, just make sure to clean it and inspect it carefully for cracks, dents, or nicks that could affect performance or lead to equipment failure. 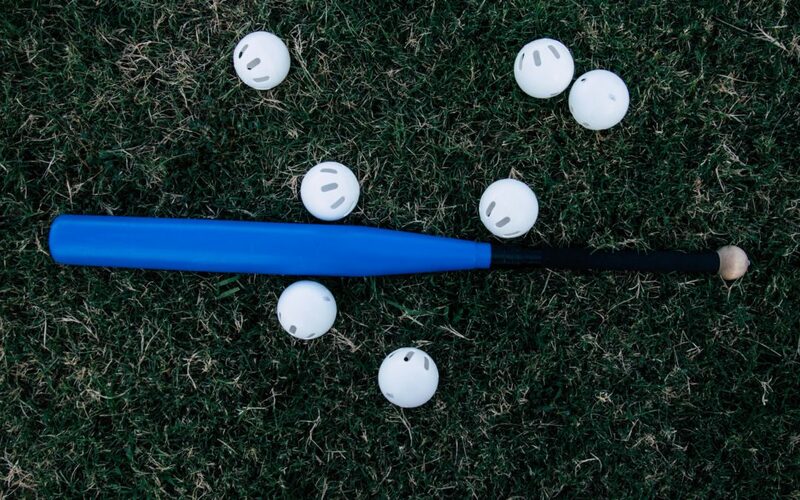 If a beloved hand-me-down bat isn’t quite up to muster for gameday, keep it at home and make it the “lucky bat” for backyard games. For a fun tradition, why not have all the kids in the family sign their names on a family bat when they play their first game or get their first home run? All baseball programs will provide equipment to start any program. Sometimes it is best to see the lay of the land and then shop after if you feel the need. Kids grow fast, and soon you too will be providing a hand-me-down bat to the parents and children that are following in your footsteps.